Welcome to Down On The Street, where we admire old vehicles found parked on the streets of the Island That Rust Forgot: Alameda, California. We're going to look at our fifth Alameda Lincoln today; of the first five, the suicide-door primered '69 was the crowd favorite in the Favorite DOTS Lincoln poll. Today's car is another suicide-door model, and the oldest of the bunch as well. This car has had a mild donk treatment, but it's just the wheels- no suspension destruction, bubbly purple window tint, or rhinestone emblems indicating wheel diameter. If you like the way it looks with these wheels, great… and if you don't, it could be switched back to factory wheels and hubcaps in a matter of minutes. For '66, the four-door sedan Continental listed at $5,750, which was 169 bucks more than the Cadillac DeVille four-door hardtop and just $17 more than the Imperial four-door. 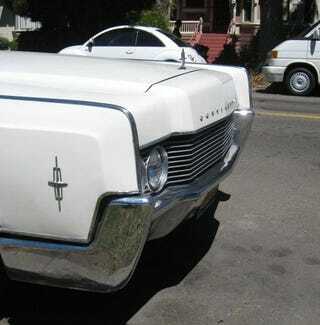 The Lincoln came with a 340-horse 462 engine, the Cadillac had a 340-horse 429, and the Imperial won the luxo-barge horsepower war that year with 350 horsepower out of its 440-inch plant. Which one was the best-looking of the three? I just can't decide!